While Netflix is touting this movie as its first major blockbuster production, I'd say it's more of a mid sized genre film which is actually perfect for what the story is trying to be. While there are fantasy elements, it doesn't go full Lord of the Rings on us and stays nicely within a story that goes a long way towards opening a big old door into a world we will want to see more of. Seriously though, who hasn't wanted to see orcs and elves roaming modern day earth with all of its crazy conveniences and technologies. David Ayers does a great job of staying within the story and takes full advantage of the creative freedom that Netflix provides. 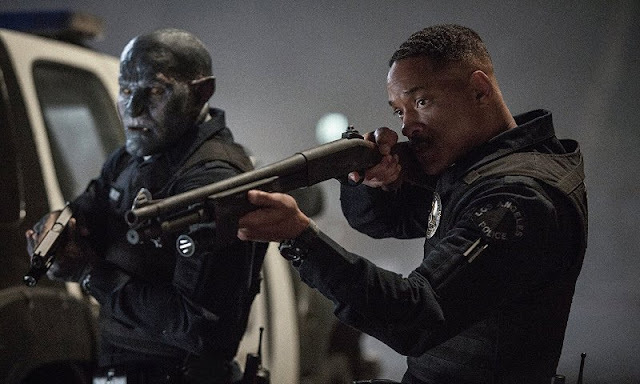 I don't care what anyone says, Will Smith is still a major Hollywood star and this movie goes a long way towards putting him back near the top. All of his trademark swagger and humor are in place and there is no doubt he is the star of the show. He is especially good when trading wits with Joel Edgerton and even better when it's time for the action to kick in, he just seems to know when to turn it on. Noomi Rapace is also a for e on screen and seeing her as the primary villain was a nice change of pace versus the type of roles she has taken on before. 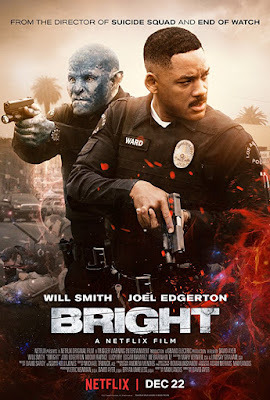 Bright is a fun movie that mixes and matches the buddy cop action comedy with fantasy style sword and sorcery shenanigans and the end result is pretty darn good. While it isn't ready to compete with some of Hollywood's heavy hitters, I feel like this is just the beginning for what could be a very competitive franchise.